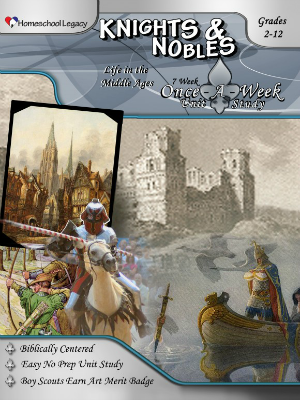 We have spent this year studying the middle ages, so it was with excitement that we began our review of Knights & Nobles, a once a week unit study from Homeschool Legacy. This is a digital history unit study that is listed as suitable for grades 2-12, as well as fulfilling the requirements for the Boy Scouts Art Merit Badge. The study utilizes various learning tools and methods which makes it suitable for nearly all types of learners! The study is designed to last four to five weeks, depending on if your family chooses to do the final feast. Each week has it's own topic (Castles, King and Queens, Knights, and Life on a Manor) with activities and reading suggestions to support the theme. The premise of the study is to continue your regular lessons four days of the week, excepting the addition of the recommended reading from Knights & Nobles. One day would then be set aside as the unit study day to complete the various activities for the week. The schedule also suggests taking another afternoon or weekend for any related field trips that may be feasible for your family. A selection of read-aloud books to be used during the entire unit is provided up front. The author states that it is not intended for families to read every book listed in the read-aloud and independent reading sections. Instead, a wide variety of books of various reading levels are provided to ensure ease of use. Think of the list as a buffet. Watching Cathedral and she researched why the era is called the Middle Ages / Dark Ages. Each week the plan begins with a list of suggested topical reading material, which are in addition to the read-alouds. Every resource recommended includes the Dewey Decimal system call numbers for ease in locating the item at your local library. Any book which is necessary, or where equivalent information is needed, to complete an assignment is marked as such. All the others resources are completely optional. The reading list may also include video options from the library or Netflix. The types of projects or activities vary from week to week, but all include some history, language, family devotion, hands-on project, and family time. The very end of the study has plans for a royal medieval feast, complete with menu ideas and recipes. The feast outline also includes medieval manners instructions, entertainment ideas, prop and decoration ideas, clothing, and speech suggestions. If you've ever wanted to hold a medieval feast, all the ideas you need are right here! We found this unit study extremely easy to incorporate into our regular lessons, just as intended by the author. The variety of activities and learning methods also suits our schooling approach for Amber with her chronic illness. There are many days when her brain does not cooperate and reading comprehension does not happen. On one such difficult day, Amber quite enjoyed watching video versions of a couple books she would have normally read. I had happily borrowed them from our library immediately after my first scan of the unit study. I seriously never thought to look for video versions of non-fiction books! Designed her own coat of arms with an online app and reviewed feudal class structure. We do not use textbooks in our history lessons, so the literature approach used in Knights and Nobles suited us perfectly. I have to admit that during the actual review period Amber didn't read much from the suggested list simply because we had read almost all of the necessary books earlier this school year. I obviously, and whole-heartedly, approve of the reading list given! I would suggest one lovely resource we found that so perfectly complements a Week Two project; it's a Color Your Own Book of Kells coloring book. Amber loved the once a week project day schedule too. It fit so much better than trying to find time on random days throughout the week for projects that might not end up completed. However, we did not utilize the family devotions part of the study, nor did we complete every possible project. To plan out our lessons, I did sit down with Amber at the beginning of the study to go over the suggested activities for each week. Amber selected what she thought would be interesting and I then added what I thought would be a good way to fully experience each topic without over taxing Amber. Wrote a story using pictures only. We loved this unit study for the wide array of activities and the ease in which it can be incorporated into existing lessons. Some of the projects may feel a bit young for high schoolers, while a few reading assignments are above the younger grades. However, this study is wonderfully adaptive and contains so many options that it truly works for children from 2nd grade through 12th grade. The Review Crew is comprised of families with children in varying ages and abilities. This time around we reviewed a large selection of unit studies from Homeschool Legacy. Please check out what other members of the Review Crew thought of the many Homeschool Legacy unit studies!